Like most European cultures the cuisine of France cannot be discussed without taking into consideration their point of view regarding preserved meats and their humble approach towards honoring the entire animal and wasting nothing. Charcuterie is an embodiment of French cuisine in the sense that it elevates humble ingredients into a highly elegant and luxurious end-product. Making your own charcuterie is an art that takes quite a bit of knowledge, experience, and patience, however, finding the right purveyor for these goods is often much more approachable and immediately delicious. The French love to eat. Out of this desire they are wonderful home cooks and discerning patrons of the best boucherie (butchers), volailler (poultry specialists), charcuteries, patisseries (pastry shop), fromageries (cheese shop) and markets. Sometimes the majority of the meal will be made from scratch. Other times there will be a balance between that which is made and that which is purchased. While yet other times the majority of the meal will be bought already made with just a mix of freshly dressed greens prepared to add brightness and complement the delicious purchases of the day. This is not fast food; this is amazing, thoughtful food that just happens to be readily available. Picture the perfect picnic. Byob, your own baguette of course, and make sure its something crusty with holes inside, certainly artisanal. Now don’t forget some good mustard and pickles. Wait a minute, we must be missing something… ah yes the charcuterie. Charcutawho… the word comes from the French words chair meaning flesh, and cuit meaning cooked. Its use in France goes back to the 15th century. Back then the biggest challenge was to stay fed. In this spirit the ability to preserve the expensive staple of meat, which spoiled relatively quickly, was attained. The curing process was accomplished by using the elements of fat, time, and science. The French have come a long way since the 15th century. They have mastered charcuterie to the point where people around the globe cannot get enough. The charcuterie movement that has been gripping the US in just the past decade is more than enough proof that this technique has far outlived its necessity during pre-refrigeration times. The following is a brief foray into this quite impressive niche of epicurean past and present. Pate in its most broad description is a very large sausage cooked in a mold rather than casing. They are a mixture of meat, fat, and seasonings that are ground coarse, fine or pureed. A national favorite of France is pate de Campagne, a coarse grind of lean and fatty pork, with small amounts of liver, onions, white pepper and cognac. Taking a pate one step further is pate en croute, cooked in a flaky pastry that takes flavor to yet another level. The rich yet light pate, combined with the lovely accent of browned pastry in each slice makes for an exciting bite. A terrine takes the concept even further by playing texture and flavors off of each other, often layering multiple pates spiced to perfection with a layer of cognac soaked fruit pureed or a similar element to contrast. A conversation regarding charcuterie would not be complete without at least a brief mention of foie gras. Foie gras is perhaps one of the better known pates; it’s made exclusively of goose liver. It is shaped with torchon technique which uses cheesecloth to form it, by twisting the ends of the fabric tightly together to force out excess air and create a uniform texture and cylindrical shape. This lends to its presentation and mouth feel which only further elevates its incredibly decadent flavor. Mousse is not just a delicious dessert. Who knew! It is in fact yet another delicacy in the charcuterie family. Like pâtés, they can be made from a variety of meats. But a mousse is much more finely ground, yielding a smooth texture. While you’ll find liver in both pâté and mousse, the ratio is often much higher in mousses, which gives them the creamy consistency that they are highly esteemed for. A real jewel of charcuterie is Saucisson Sec, a cured pork sausage studded with little pockets of creamy fat with a flavor profile that varies from region to region. It provides a deep pork flavor accented with garlic and black pepper, or sometimes just salt. A whole muscle meat of France that is really beautiful is jambon de Bayonne. This delicious salt cured pig leg is PGI, which means it must come from a particular region, in this case Bayonne, and must follow preparation and aging requirements. When thinly sliced, it is truly a magical experience, created by the creamy fat that ribbons throughout each slice coupled with it’s salty yet clean flavor notes. Even better news is that this delicacy is now available in the US, while it was traditionally something that could only be enjoyed overseas. 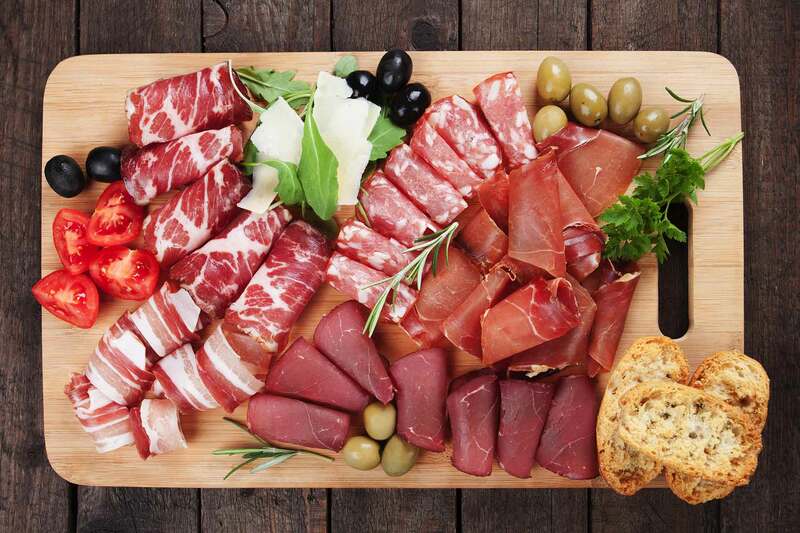 Whether you are trying to wine and dine, or just enjoy a picnic in the park there is something from the local charcuterie that will make the experience especially delicious. The French have truly mastered using every part of animal to elevate their cuisine and make taste buds smile. Enjoy life like the French, grab a baguette and begin your journey!